The bowl is a typical example of Kakiemon type porcelain with a milky-white body known as nigoshide produced sometime around the Genroku era (1688 - 1704). 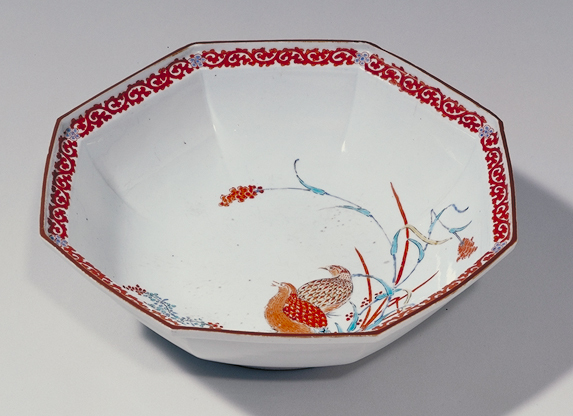 It is decorated with "quails and millet", a representative design of Kakiemon ware which was popular especially in Europe. On the interior against its pure white porcelain body are a bush clover, two quails and millet plants executed with a delicate touch of the brush in a painting-like composition in two varying shades of rich enamel colors, displaying the perfected style of Kakiemon ware. The bowl is octagonal in shape and is very thin-walled.